Such a loaded question and a difficult thing to determine. I would say most measure whether a person has been a success based on a position attained, an amount of wealth accumulated or the level of power they possess. Other views may define success as simply reaching a goal or leaving an impact on others – a legacy that lasts after the person is gone. Either way, there seems to be a fine dividing line between success and failure in the world’s eyes. To borrow a famous movie line from Trading Places, “One minute you are up half a million in soybeans and the next, boom, your kids don’t go to college and they’ve repossessed your Bentley.” One misstep it would seem can have that big an impact. Complicating the definition of success even further is that we struggle evaluating ourselves. More often than not it’s the world and other people’s opinions telling us whether we are a success or not. Instead of gauging ourselves and being good with that, we let strangers define our level of success – people who may not have all the facts, who misread our motivation and fail to understand our endgame. I don’t believe in a magic formula that defines success. There is too much subjectivity involved. For example, as I describe the life of this particular person, would you classify him as a success? …his clothing was in even worse shape. His career lasted only a short time. On one occasion, he was accused of being possessed by a demon. …he challenged the government by speaking out against its immorality and corruption. He also played second fiddle, merely serving as the setup man – the opening act so to speak – for his cousin’s greater ministry. Then, when his cousin Jesus finally did entered the scene, he voluntarily withdrew himself from the public. After his “demotion,” he was arrested and thrown in prison. While secluded there, he began to have doubts about Jesus and sent his own messengers to ask questions to confirm Jesus’ identity. His life ended with a vicious beheading at the hands of his Roman captors. Would we define this life as a success? Highly unlikely by today’s standards. So through all his life issues – poverty, questions and accusations, loss of his job and senseless death – John the Baptist obediently followed God’s plan for his life. He knew what his role was and, more impressively, it pleased him to fulfill it. Perhaps this challenges you like it does me to rethink the definition of success, especially as an outside observer who doesn’t always understand the motivations of a person’s heart. I’m content to let people determine it for themselves based on their own self-evaluation. Who am I to judge their success? Questions: What is your definition of success? Have you known someone who considered themselves successful, even though those on the outside did not? Can you be successful without reaching every goal you have in life? I typically define success in worldly terms. Because of my interest/obsession with personal finance, I think I let money and measures of money define my goals and success a bit (or a lot) too much. I’m with you. It’s such a temptation to make success all about money. Excellent post, Brian. I constantly have to remember to look at success as a whole and not measure it by my personal career standards (which is what I naturally tend to do). Now, I try to include relationships and health and everything else that makes life full as a measurement of success. “…not measure it by my personal career standards…” That’s tough to do. So much of our life is centered around our career. It defines us in many ways and is the natural way others lean on to analyze our success. I think success is trying to live your life with as much goodness as you can given what you know. Its not about what society says, but its about what can you do each day to make the world a little bit better, no matter how small. Sometimes that will mean sacrificing those things which might make more money, but ultimately those are the sacrifices that make one successful. I like your perspective and your take on sacrificing. 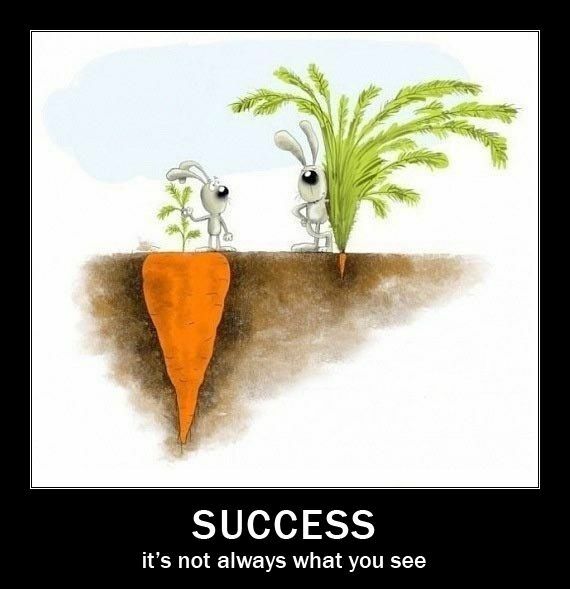 That’s usually the big key to reaching one’s definition of success. “…doesn’t always understand the motivations of a person’s heart.” Yes! I agree with this. I don’t have a “traditional” view of success. I don’t need to make six figures a year or have a prestigious title at a Fortune 500 company. My motivation is mainly to help others (and still make a living, of course). But sometimes it’s hard to take the other road when everyone else looks down upon you for it. I think many people would be better off listening to their hearts, as they end up miserable with their jobs and how their life turned out because they conformed to society’s definition of success. “…it’s hard to take the other road when everyone else looks down upon you…” Boy, isn’t that the truth. The temptation to follow the crowd, especially when under pressure, is so tough to fight against. The key is defining your own success. You can’t allow others to define success for you. But even if you define success for yourself, you need to write it down. Otherwise, it becomes too easy to constantly change your definition of success and you will always be chasing it and never actually attain it. Don recently posted…What Is Your Approach To Life? “…you need to write it down.” A great suggestion Don! That provides concrete, visual evidence of what you intend to accomplish. It’s something you can always be reminded of when you get off track or confused. Otherwise, like you said, a person will be easily swayed by others. Isaiah 55:9 says “As the heavens are higher than the earth, so are my ways higher than your ways and my thoughts than your thoughts.” I’ve had a few things this year happen that really reminded me of this truth, including a sabbatical this spring and the birth of our 3rd child yesterday. Whenever I get that much time away from the “stresses” of life I more easily see the worthlessness of defining my success based on my job/income/status. It’s very hard to have an eternal mindset in the day-in, day-out routine, but that’s what we’re called to do and that’s exactly what John the Baptist demonstrated. Thanks for the reminder Brian! Wow…congrats on the newborn. That’s awesome! Moments like that really do change our perspective. My guess is you will see success more through the lens of child training and how they turn out/mature. I know that’s where my efforts as a father are focused at right now. I think success is so often defined externally, by other people, and that is not how it should work in my opinion. I think we all have different ideas of success, so I try to measure it based on what I want to see come out of my life. I think we are the best evaluators of our own success…as long as we are being honest with ourselves. Thank you for this article. As I head off to work this morning, it’s good to have a reminder that God’s version of success is different than the world’s. An important reminder on making sure my priorities are right. “…God’s version of success is different…” So true Kirsten. I need to remember that more often.